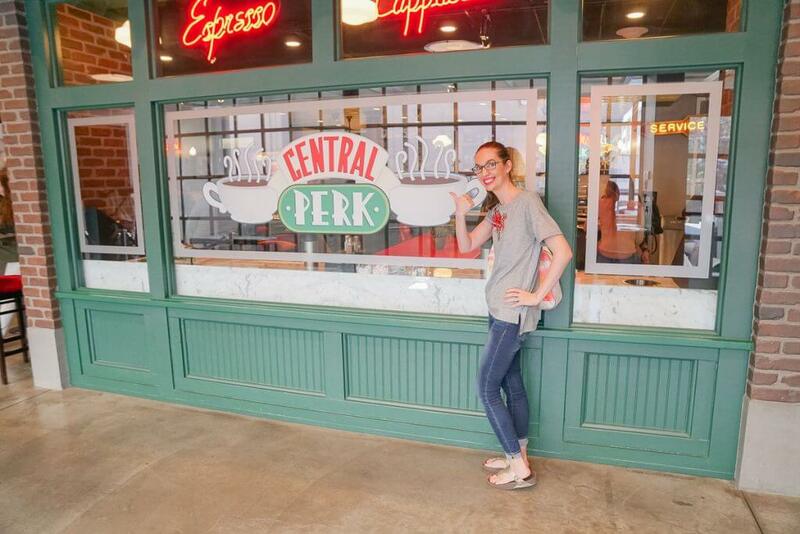 Want to have coffee at the real Central Perk from Friends? 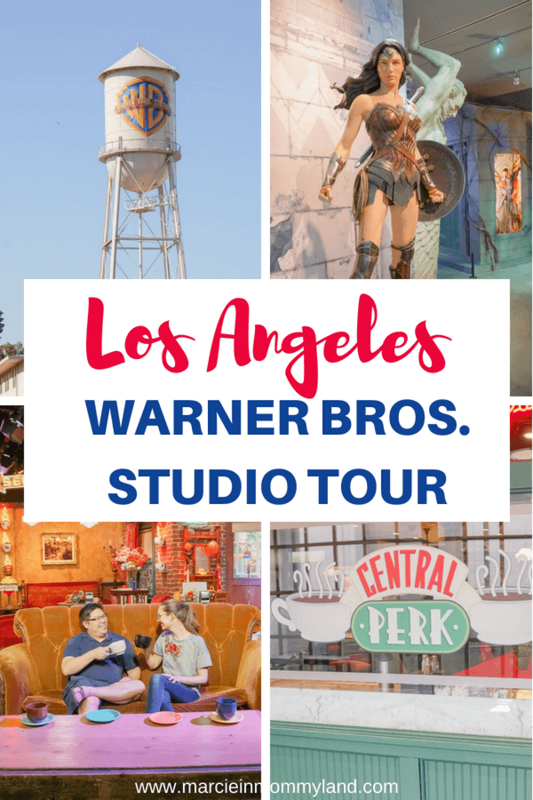 Find out where it is on the Warner Bros. Tour in Los Angeles, California. Even though we already got to attend a live taping of The Late Late Show with James Corden and VIP treatment at Universal Studios, I was super excited for this WB Studio Tour! 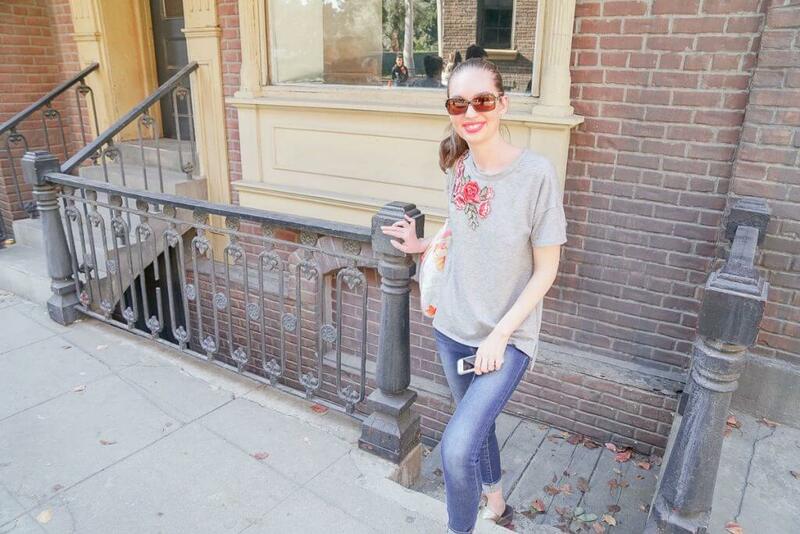 When we first arrived for our Warner Bros. Studio Tour in Hollywood, we headed outside to the security area. We just brought a small bag and a camera with us. We hit up Starbucks on the drive to the studio, but we could have just grabbed stuff at the Starbucks located inside the waiting area. 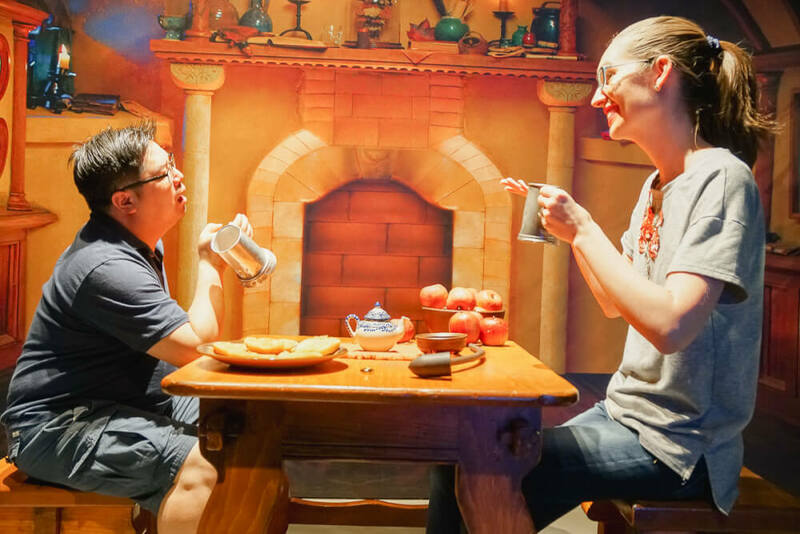 Guests can bring food/drink on the WB Studio Tour. Then, we were ushered into a small theater with 3 other groups to watch a video featuring Ellen DeGeneres. She told us what to expect on our tour and a few rules. It was just enough time to take a few swigs of coffee and then the guides came in to collect us. Our tour guide Devyn was a 20-year-old engineering student. He used his youth to his advantage and was honest about the movies he hadn’t seen. That made the tour a bit more interactive as we could all interject our own memories of certain movies and iconic scenes. My favorite part of this Warner Bros. Studio Tour was driving around the back lots. I’m a TV nut. I thoroughly enjoy my TV shows and binge watch series at a time. We got to see several streets that replicated Anytown, U.S.A and could be easily transformed with a few signs and decorations. , Toby Maguire had to wear cotton in his nose to keep from drowning in the rain! Fun fact: Did you know the rain in movies contains milk to make the raindrops 3x larger and appear better on film?
. My friend told me it was her guilty pleasure show, so I immediately started watching it during my son’s nap time. I’m so glad I watched it because we drove through the whole town of Rosewood! 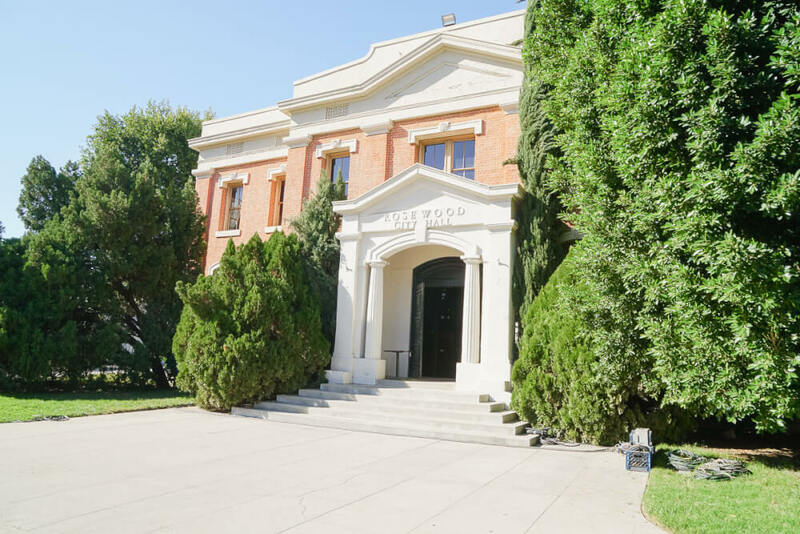 The coolest part was seeing how Rosewood Middle School was written on one side of a building and Rosewood High School was written on the other side of the same building. 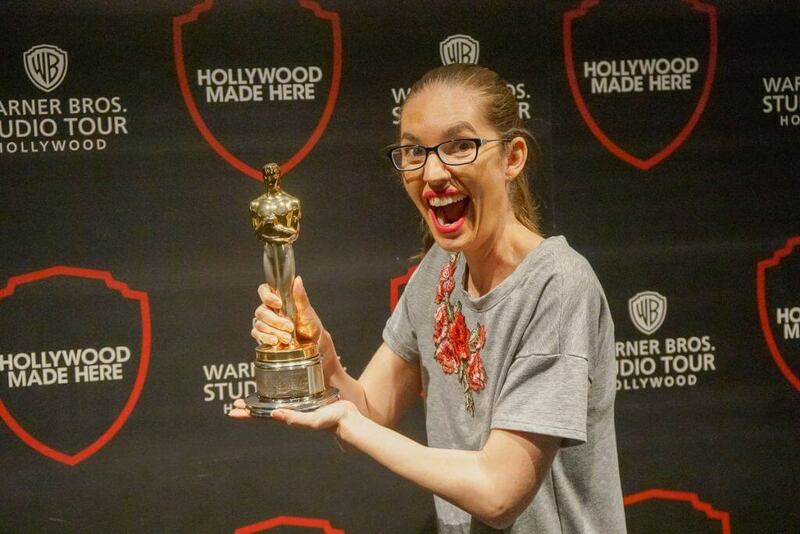 This magic of Hollywood revealed itself during our WB Studio Tour! also used a lot of the same sets at Pretty Little Liars! It’s amazing how changing a sign can completely trick the brain into thinking it’s a new space. I was bummed that we didn’t come here last year so we could see Stars Hollow in all its glory. 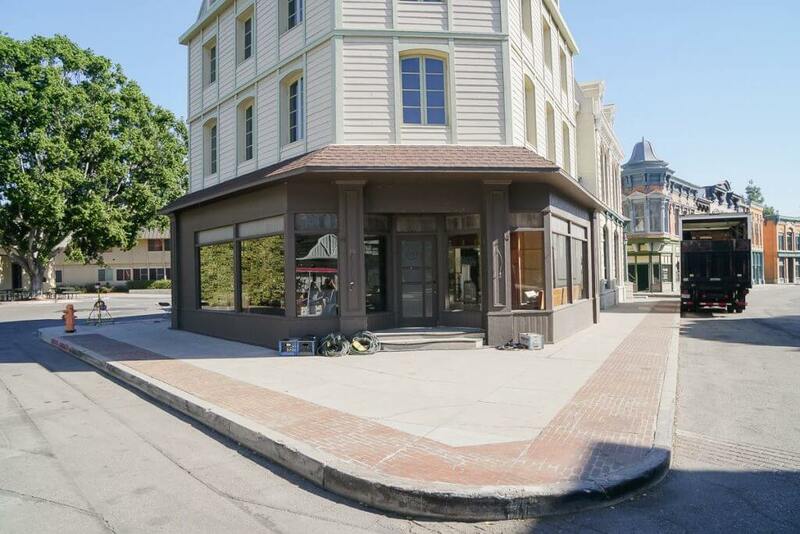 But, I will say I still felt the spirit of Rory and Lorelai as we drove past Luke’s Diner and Patty’s Studio.
. If you haven’t seen it, stop everything and set aside the next few weeks to watch it! That scaffolding for the “L” Train is really just wood and paint and would crumble under the weight of a train. was quick witted and so entertaining. I tried to get tickets to a taping of The Ellen DeGeneres Show, but they were all sold out! So, it was a great consolation prize that we got to explore her studio. Our guide Devyn asked if any of us were football fans. My husband and I shot up our hands. We love our Seahawks! 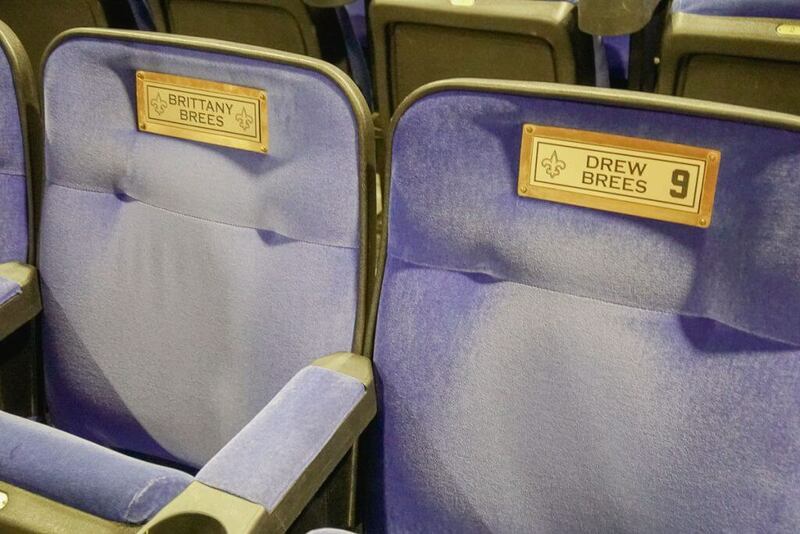 He told us we could sit in Drew Brees’ seats, which was neat. 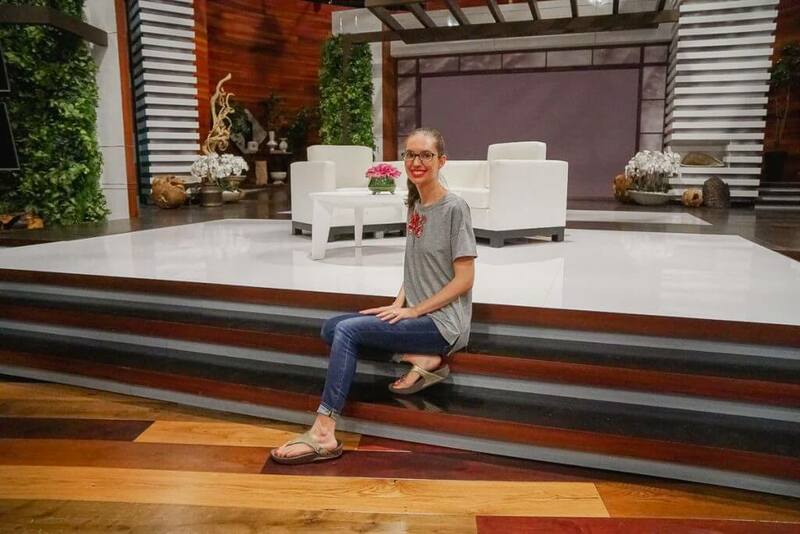 After a brief talk about what happens on The Ellen DeGeneres Show, we were able to walk around and snap a few photos around the studio. The big rule was we couldn’t sit in the chairs on stage, which makes sense. Other Soundstages at Warner Bros.
We weren’t able to see any other soundstages on this Warner Bros. Studio Tour. 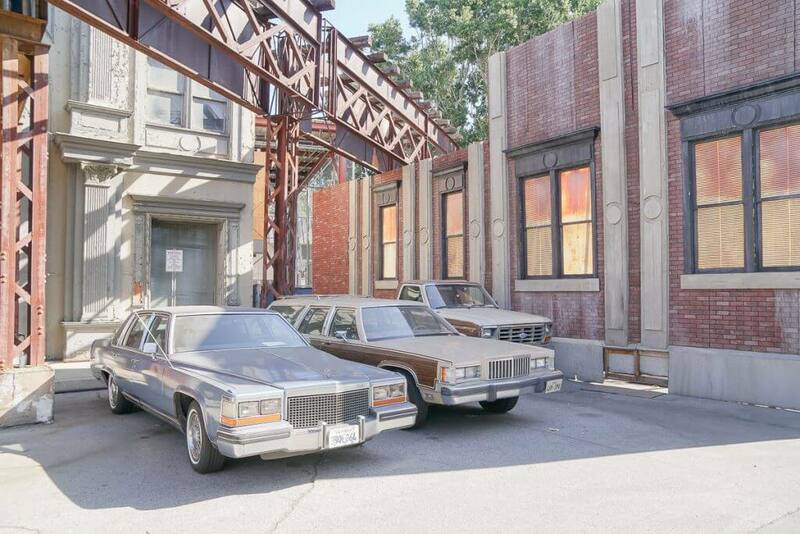 That was a bummer because I purposefully signed up for a weekend tour thinking that we’d be able to see more soundstages if shows weren’t filming. , The Fosters, and Fuller House. book. I’m waiting until my boys are older and I’d like to read it to them as a bedtime story. Or rainy day story. on HBO. I’m so glad I did because it made this exhibit really come to life! In the back of the exhibit, you have the opportunity to let the Sorting Hat tell you which house you belong to. There was an employee in charge of holding the hat above every guest’s head. I think she no longer felt the magic. My husband went first and was very excited when the Sorting Hat said “Griffindor!” I got Hufflepuff, which was also cool. 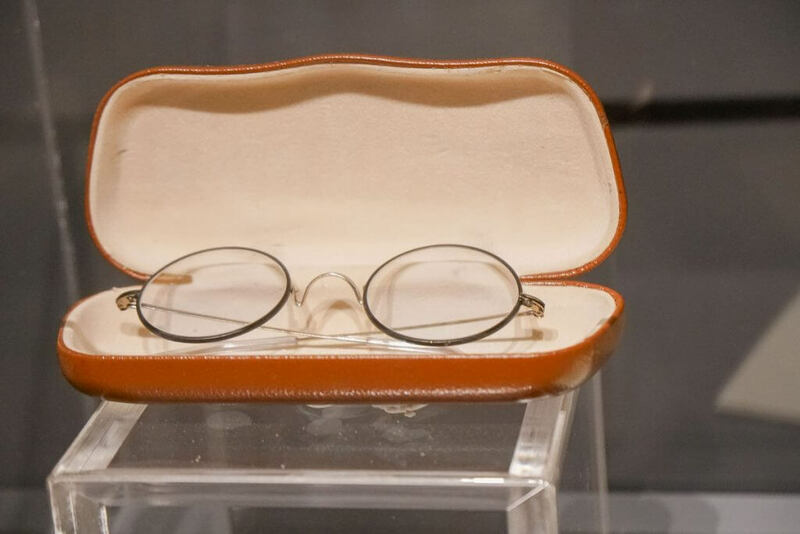 Props from the Fantastic Beasts and Where to Find Them.
. We happened to just watch the movie after we went through Harry Potter withdrawals. It was really cool to see some of the costumes and props from the movie. 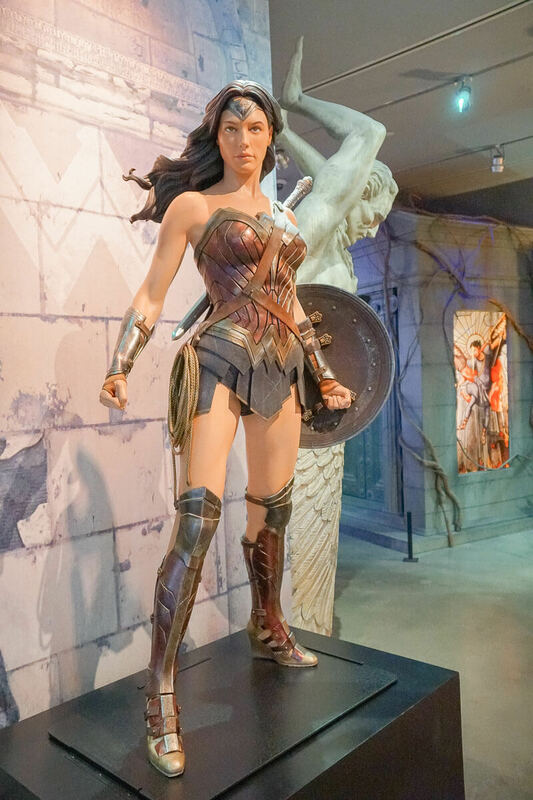 I’m not that into superheroes, so I breezed through this exhibit featuring DC comics. But, my husband is a superfan and snapped a ton of photos! I really enjoyed looking at all the costumes. I was seriously shocked that Wonder Woman’s costume is made of the same material as any Halloween costume. It looks much sturdier and grand on the big screen. I had no idea that Batman was 75 years old! 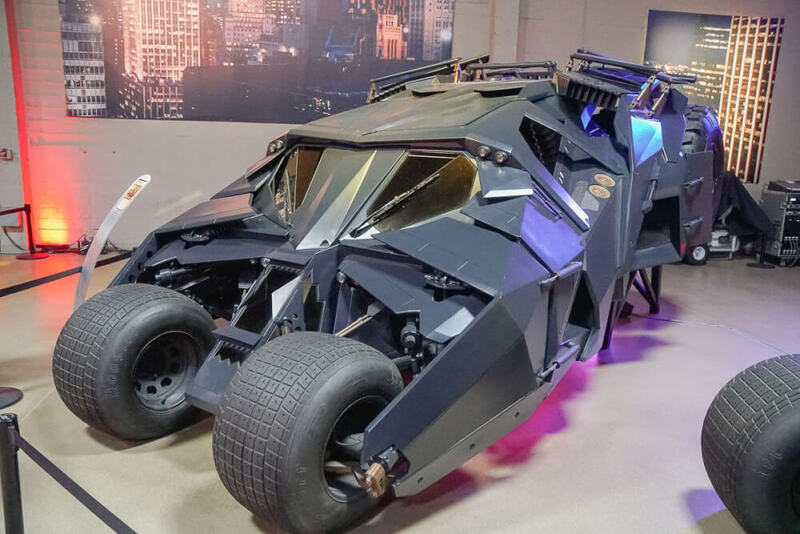 Our guide Devyn brought us into an unassuming soundstage filled with Batman vehicles. We only had about 3 minutes to explore, so my husband quickly ran around snapping photos. While I thought the cars were cool, I was more interested in the Bat Signal. 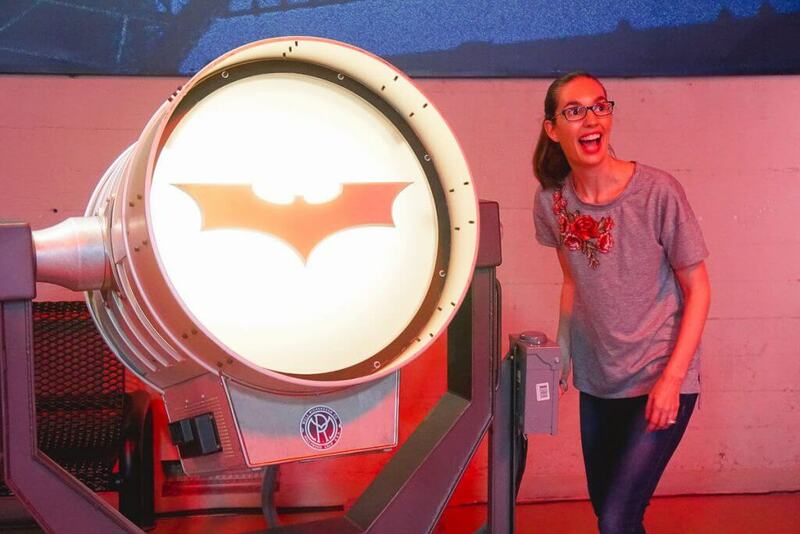 Guests were allowed to flip the switch and the Batman logo appeared on the opposite wall. It was a strange feeling of power and I LOVED it!
. It’s the first thing we saw when we entered Stage 48. It’s a real, working coffee shop and you can sit and enjoy a beverage before exploring Stage 48, or grab something on your way out. This is different than the Friends studio set. You’ll love this area if you are fascinated by the whole film making process. It’s a fairly interactive spot where you can swipe on screens to create costumes. They also feature an inside look at casting. I saw a lot of head shots of kids I’d never seen before, which was a good reminder just how difficult it is to get into show business. 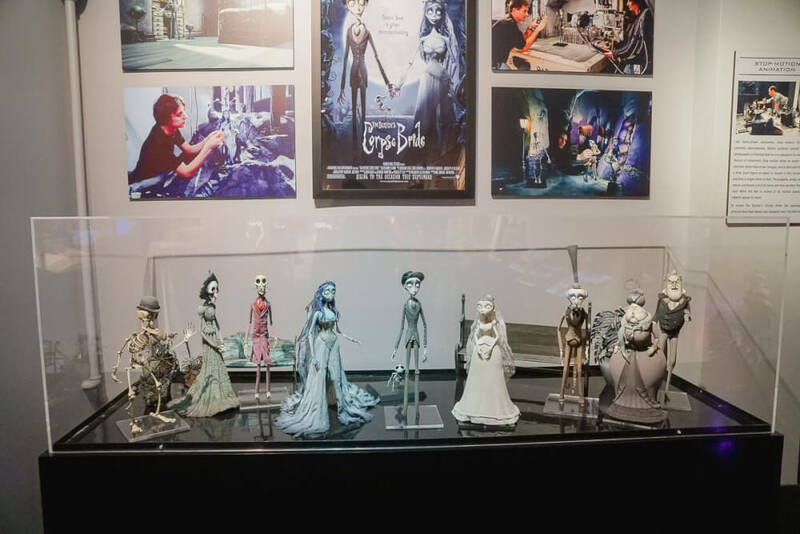 This figurines from the Corpse Bride were just one of the many exhibits in the pre-production area of Stage 48 on the Warner Bros. Studio Tour. So, now that you’ve seen the work that goes in before the cameras start rolling you are ready to shoot. Here’s your opportunity to pretend to drink coffee in the set of the Central Perk cafe as part of the Friends studio tour. Usually they have a photographer there to take professional photos. He was on break when we visited, so an employee used my camera to snap a few pics. She took them on the opposite side from where the professional shoot was set up. We walked past lots of costumes from classic Hollywood films. It’s always cool to gauge how large/small an actor is in real life. And to see that most of the costumes aren’t as grandiose as they look on film. Something I always wondered when watching fantasy movies, is how they make actors look like giants or elves when they are next to a human character. It’s a photo op where you and another person sit at the table. One will look huge and the other will look small. If you do it, make sure to switch places and take a few more photos. Note: the employee working when we were there looked miserable, but he did take a couple of photos with my camera. So, you’ve experienced the pre-production and actual production. Guess what’s next? Yep, it’s the post-production part of the Warner Bros. Studio Tour! Here, you have the opportunity to film something on a green screen. When we were there, the options were Harry Potter and Batman. We waited in line for a bit and watched other tour guests film their little videos and pose for photos. I’m glad we watched because we knew to lower our expectations when it came to customer service. Every employee working in this area looked like they were having the worst day ever. When it was our turn, my husband and I both said we’d like to do the Harry Potter scene. She grabbed a couple of robes for us to wear and wands to hold. Then, the employee had us both sit on a broomstick together. I sat directly on the stick and my husband sat on the edge of a metal seat. It may have been the most uncomfortable place either of us had sat before. She muttered a few instructions at us as she filmed. My husband and I are good sports and we had fun with it. Then, we headed to the desk to view the video and photos. It’s what you’d expect and the prices are also what you’d expect. when it came out. It looked really intense to me and so I hadn’t seen it before. They showed us the scene in the movie where Sandra Bullock is detached from the space shuttle. First, it’s just the dialogue and it doesn’t seem that dramatic. Then, they add in sound effects and background noise. When they add in the dramatic soundtrack, it’s quite a powerful scene! There were so many cool aspects to this Warner Bros. 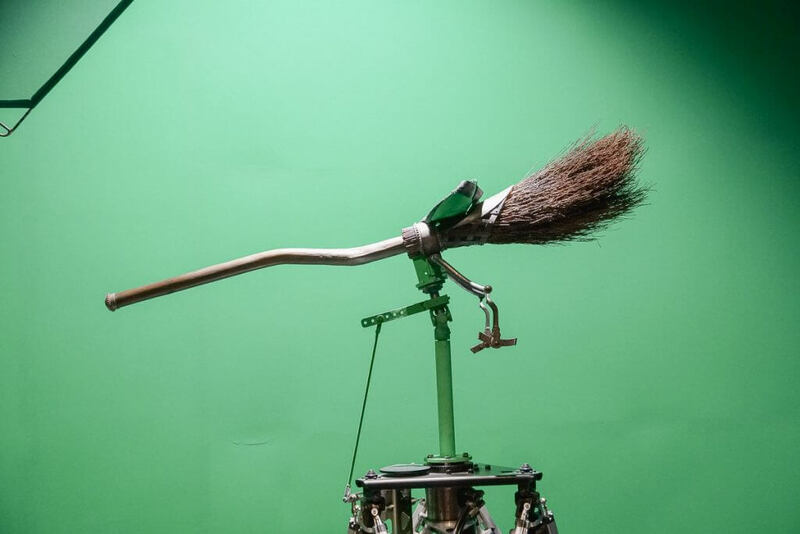 Studio Tour. The backlots were incredible! I appreciated the size of our tour group. And it was a relaxing experience. However, the last part of the tour was really underwhelming. The employees clearly didn’t want to be there and they made zero effort to show otherwise. 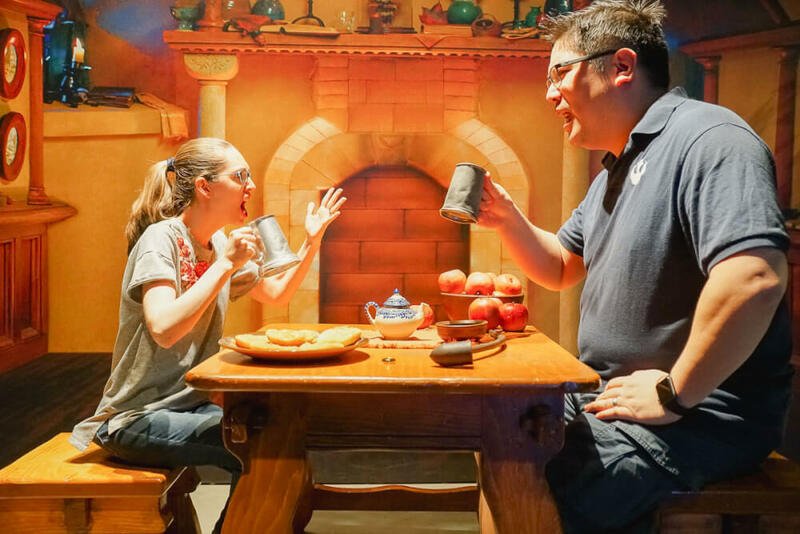 The guy taking our photo at the forced perspective table wouldn’t talk to us and we weren’t sure if he had actually taken any photos until we got our camera back. And the woman doing the Harry Potter video and photos might have been the most unsatisfied employee I’ve seen anywhere. Her dead expression left us feeling uncomfortable. That being said, I’d still say this Warner Bros. Studio Tour was worth our time and money. It did make us wonder about the VIP experience there. Next time, I think we’ll opt for that so we can get off the tram a bit more and hopefully encounter happier employees. Find out which Warner Bros. 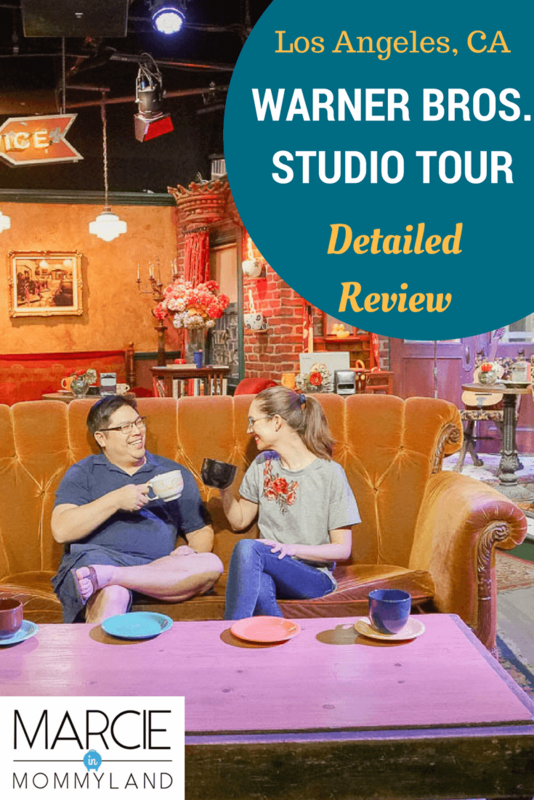 Studio tour is right for you! There is plenty of WB Studio Tour parking available in their garage. Or you can take a taxi, Uber, or Lyft. They can drop off/pick up at the loading zone. YES! There are so many cool photo ops and photography is encouraged for most of the tour. Since it’s a working set, you might not be able to take photos of some areas. Your guide will make it clear when you can’t take photos. Unfortunately, filming is not allowed. WILL I SEE TV STARS? As this is a working set, there is a chance you’ll see actors and celebrities. Our tour guide told us he frequently sees the kids from Young Sheldon during his tour. However there is no guarantee. We didn’t see any celebrities on our tour. Being from Seattle, coffee is a priority! There’s no need to grab coffee on the way because there is a Starbucks right as you enter the building. Plus, you can get coffee at Central Perk cafe near the end of your tour if you need another dose! Thanks so much for the sneak peek! Looks like so much fun! I’m a huge TV and movie nut, so it was super interesting! We got to see a lot of cool memorabilia! I would love to visit the Warner Brothers studio one day! It’s something I’ve never considered before, believe it or not! But your post is so detailed its making me wanna go for sure! Thanks for sharing about your ur tour! I hope you can swing by sometime! I’ve also heard the one in London is pretty cool! How nice! Looks like you had a ton of fun! It’s so fun to see how movies are made! This is amazing! I am a big TV and movie nerd, so this sounds like my cup of tea! 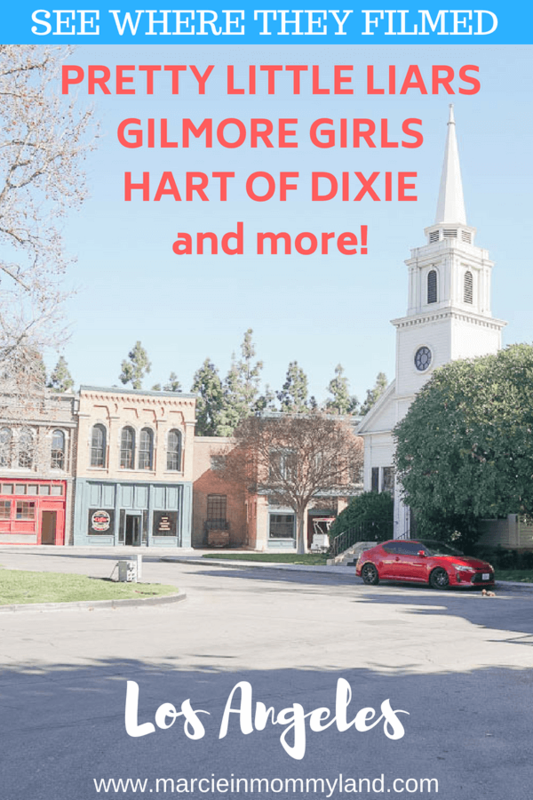 I love Gilmore Girls, so I would have loved to visit some of the sets and what can I say about Friends and Harry Potter! That perspective table is awesome, BTW! I couldn’t believe my eyes! Also, thanks so much for sharing the aspects you did not like about the tour, it is also good to know the downside. Such a shame about the staff, I usually find Californian customer service to be amazing, but I guess it really depends on the person. Wasn’t Gilmore Girls so good? I binge watched it right before the revival of Gilmore Girls: A Year in the Life. This is such an amazing opportunity. I definitely binged P at times. It was a great way to spend a morning! 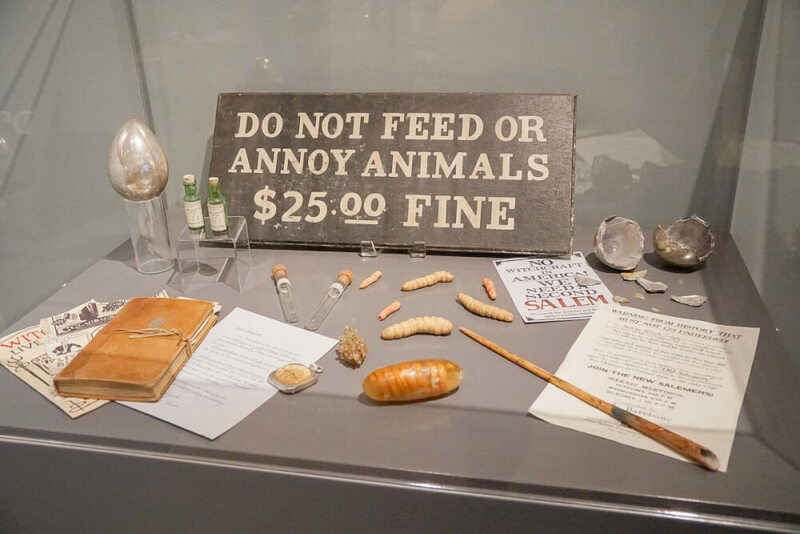 Yes, it was crazy to see some of the stuff up close! This looks and sounds like a lot of fun. I need to check it out. It was a pretty fun tour! Great pictures–the tour looks like so much fun! Thanks for all the information. I would definitely consider the tour after reading this. It was so cool to get a sneak peek at the magic of Hollywood! Love every bit of this and now I must go there! Thanks for sharing! I hope you do! It’s a fun excursion! Seems like yall had a great time at the studio! Love the pics and details! I loved how small our tour group was! It’s always fun to see how movies are made! Thanks for sharing your tour experience with us. I would love to go on this tour with my husband some day. Getting to see the magic of Hollywood and go behind the scenes of shows you’ve watched would be an awesome experience. This made me miss working in California so badly! I love WB studio lot!!!! Oh how lucky! There are so many cool things to do in CA! This looks like so much fun !! I would LOvE to go here !! I hope you get the chance someday! It’s always a new experience! It’s been my guilty pleasure show! That is SO COOL!!! I’m a complete Harry Potter and LOTR nut so those two exhibits would definitely be my favorite. I need a photo at the forced perspective table! That table was crazy! I had no idea that’s how they shot it! I would love to do this tour! We have done the universal studios one and loved it! It’s just super neat to see all the sets and stuff! Thanks for sharing! I totally geek out over TV sets! I cannot believe I have never done this on all my trips to CA!! Adding it to the list now!! Oh you should totally do it! Super fun! This is SO awesome!! 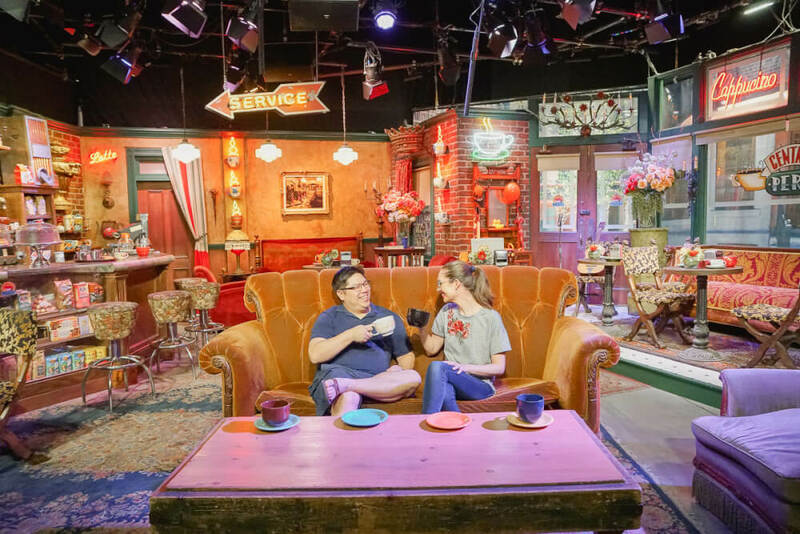 I think I would have fan-girled so hard visiting the Central Perk and Big Bang Theory Sets. I am definitely signing up for this tour when I have the chance to go. Central Perk was so crazy to see since it’s on TV all the time! That is so awesome…especially Ellen’s set! That’s a bummer you couldn’t get tickets. This is such a great review. Thanks for sharing a sneak peak of it! Tickets to her show are super tricky! But, we did score tickets to the Late Late Show with James Corden! Universal Studios was one of my favorite places to visit! So much fun seeing familiar movie scene backgrounds. We also got to see Conan O’Brien while we were in the area! Oh how cool! I’d love to see Conan! Hi Marcie ??? I’m glad you enjoyed the tour and reading this review really put a smile on my face. Hope to see you again for the VIP tour! Yay! That’s so much for an awesome tour! We definitely want to try the VIP tour next trip! Haha! Glad you found this post!